Croatia Airlines: could its network attract a bidder? Following recent reports that the Croatian Government plans to sell a stake in its 98% owned national carrier by 15-Oct-2013, media reports have linked Garuda Indonesia, China Southern and Etihad Airways with a possible bid for Croatia Airlines. All three have denied that they are in talks about an acquisition, but attention is likely to focus increasingly sharply on the loss-making Zagreb-based carrier. 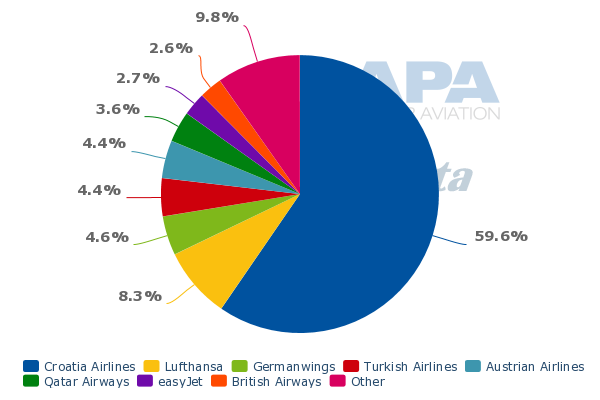 Around 20% bigger by number of seats than Air Serbia (formerly Jat Airways), in which Etihad recently bought a 49% stake, Croatia Airlines is a member of the Star Alliance and has codeshares with a number of European alliance partners. In this first part of a planned two part report, we analyse Croatia Airlines’ network and ask whether it might have some appeal to a prospective bidder. In part two, we will examine its finances and cost base and consider their impact on the possible privatisation. Operating with an all-economy class product, Croatia Airlines is a monopoly operator of domestic scheduled airline seats in Croatia. 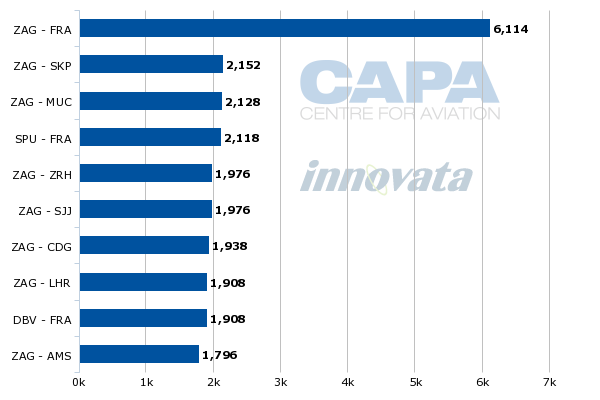 On international routes, however, although it is the number one carrier, its share of seats is only 20% and LCCs easyJet, Ryanair, Germanwings, Norwegian Air Shuttle, Vueling and Jet2.com occupy six of the top nine positions. 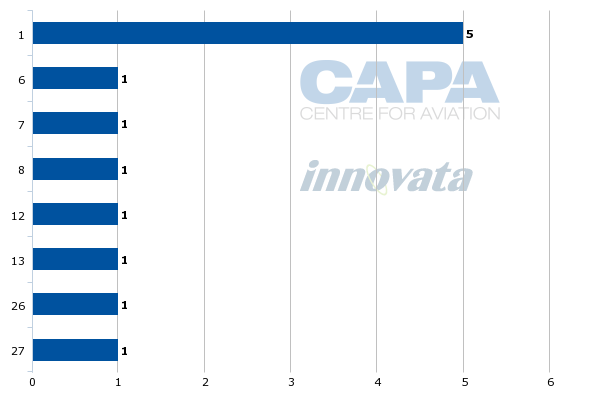 LCCs have a market share of around 50% on international routes from Croatia (ranked by number of seats, source: Innovata, week of 26-Aug-2013). The Star Alliance, of which Croatia Airlines is a member, has a share of 43% of international seats in Croatia. There is virtually no international capacity from Croatia to destinations outside Europe. Croatia Airlines’ main base is at Zagreb and it also bases significant capacity at Split and Dubrovnik. It is the largest airline at Zagreb, ranked by seats, with a market share of 60%. Star Alliance partners Lufthansa, Turkish Airlines and Austrian Airlines also have a significant share at Zagreb. 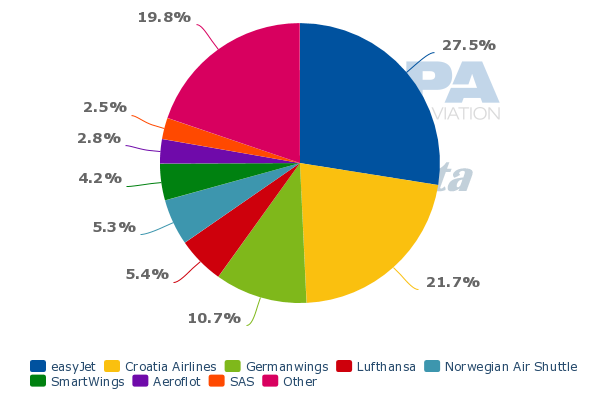 At Split, Croatian’s 22% share of seats puts it in second place, behind easyJet's 28%, and LCCs Germanwings, SmartWings and Norwegian are also present. At Dubrovnik, its 21% share just beats easyJet's 20% for first place, although LCCs Norwegian, Jet2.com, Monarch and Vueling are all present too. With regard to its smaller Croatian bases, it is number two at Zadar with 16% of seats, behind Ryanair on 64%, and at Pula it is also number two to Ryanair (with 21% versus Ryanair’s 35%). Croatia Airlines’ network is strongly focused on Europe (including domestic destinations), with only one destination, Tel Aviv, outside the continent. Its route map has some noticeable gaps in some of Europe’s largest countries for air travel, in particular Spain and the UK, in each of which it only has one destination (London and Barcelona), and also in Scandinavia and Portugal. It reaches a number of additional destinations through codeshares with Austrian Airlines, Brussels Airlines, Lufthansa, SAS, SWISS, TAP Portugal, Turkish Airlines and US Airways. 28% of its seat capacity is domestic, with 72% international. Most of the international seat capacity (85%) is to Western Europe, with 13% to Eastern/Central Europe and 2% Middle East. Croatia Airlines is reportedly considering adding long-haul routes onto its network (Aviation News Online, 05-Aug-2013). Croatia Airlines’ number one country destination is Germany, where it flies to five cities (Frankfurt, Munich, Düsseldorf, Kassel and Berlin). France, the UK and Italy, three of Europe’s remaining four top aviation markets, also feature in its list of top country destinations, as do Switzerland, Austria, Belgium and Denmark, which are home to Star Alliance hubs. Croatia Airlines is the only operator on all of its domestic routes, which are dominated by routes from its main hub Zagreb to its other two significant hubs Dubrovnik and Split. Croatia Airlines’ list of top 10 international routes contains five linking Croatian airports with Star Alliance hubs Frankfurt, Munich and Zurich, in addition to Europe’s other major aviation hubs London Heathrow, Paris CDG and Amsterdam. Balkan destinations Skopje and Sarajevo complete the list. Croatia Airlines is number one on nine of its top 10 international routes and top two on all 10. 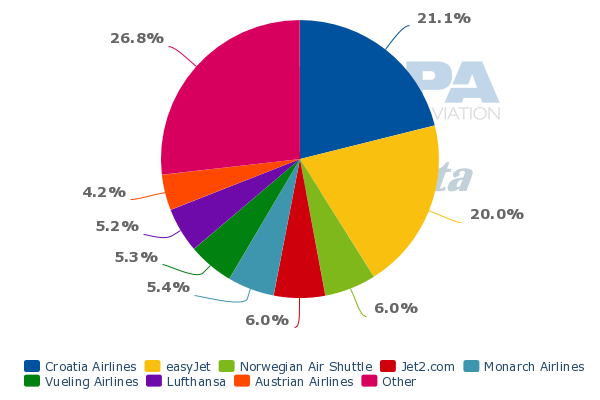 It has four monopoly positions on this list and a further four where codeshare partner Lufthansa is a significant operator. It faces competition from non-partner airlines on only four of the routes, but it is number one on all four. There is LCC competition (from easyJet) on only one of its top 10 international routes, from Zagreb to London (Croatia Airlines flies to Heathrow, easyJet to Gatwick). Looking at international routes outside its top 10, a little more competition is evident. Nevertheless, out of 16 additional important international routes, Croatia is a top two operator on 15. It is number one on seven and enjoys a monopoly on five. Where there are other players, these take the relatively friendly form of a codeshare partner on four of these routes. Croatia Airlines faces competition from non-partner airlines on seven of the 16 routes, including LCC competitors on six. As we have seen, Croatia Airlines has a fairly strong position on many of its key routes, including a monopoly on domestic routes and top two positions on almost all major international routes. However, its relatively small share (20%) of all international seats from Croatia tells a different story from that suggested by this analysis of its competitive position on its major routes. The key to resolving this apparent contradiction is to look at all major international routes from Croatia. Croatia Airlines is not present on a number of important international city pairs, including Dubrovnik to London and Barcelona and Split to Prague, Milan and Cologne/Bonn. Moreover, some major European destinations, for example Madrid, are not served from Croatia at all. This suggests that there could be an opportunity to stimulate demand to a number of destinations with an attractively priced offer. A number of Croatia Airlines’ routes are operated only in the summer, reflecting the leisure focus of much of its network. 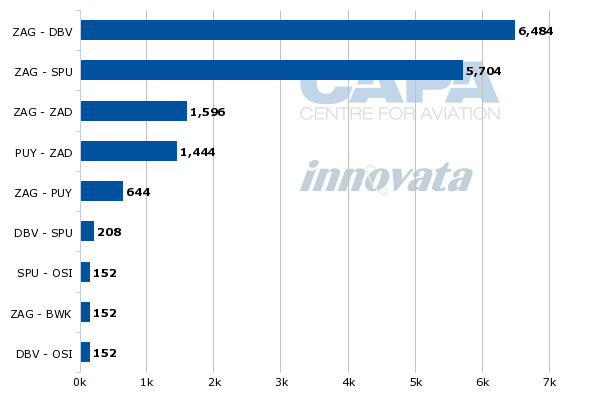 According to data from Innovata, its seat capacity in the four week period commencing 6-Jan-2014 will be only 60% of its capacity in the four week period commencing 12-Aug-2013. This compares with a figure of 80% for all airlines in Europe. This strong seasonality presents a challenge to achieving year-round profitability. The leisure orientation of the network also reveals itself in Croatia Airlines’ relatively low frequencies on many of its routes. It serves five domestic routes with only one frequency per week and only five with more than one daily frequency. It serves 11 international routes with only one weekly frequency and only seven more than once daily. Does Croatia Airlines have enough value to attract a bidder? In spite of its domestic monopoly, any interest in Croatia Airlines from a foreign bidder would likely focus on the international market from Croatia to the rest of Europe, since Croatia’s international market is almost 13 times the size of its domestic market. 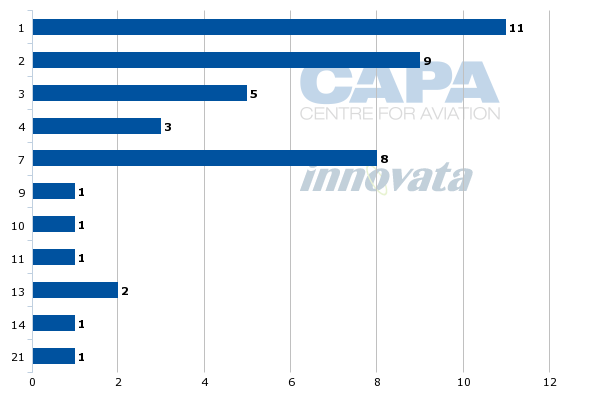 However, Croatia Airlines has only 20% of seats in the overall international market from Croatia and this will likely be seen as a weakness to a carrier from, say, Asia or the Middle East seeking significant additional access to the rest of Europe. It seems less likely that a European airline will make a bid for a stake in Croatia Airlines since they can already access its markets directly. Croatia Airlines has some good positions on the international markets that it serves: it is the number one or number two airline by seats from Croatia to 19 out of its 22 international European cities. These strong market rankings could potentially be of interest to a bidder seeking access to those cities. 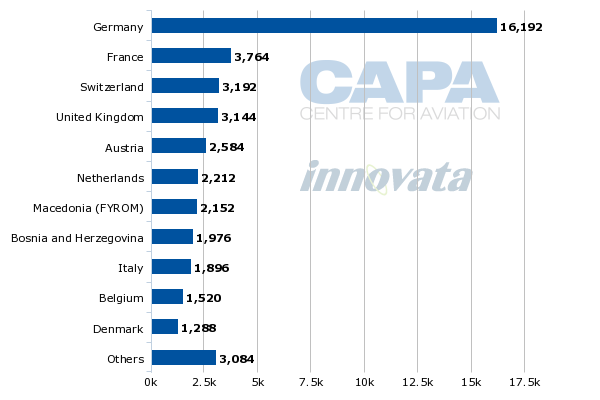 However, many of the cities that it serves rank among Europe’s principal aviation destinations and are likely to be served already by any significant international airline. 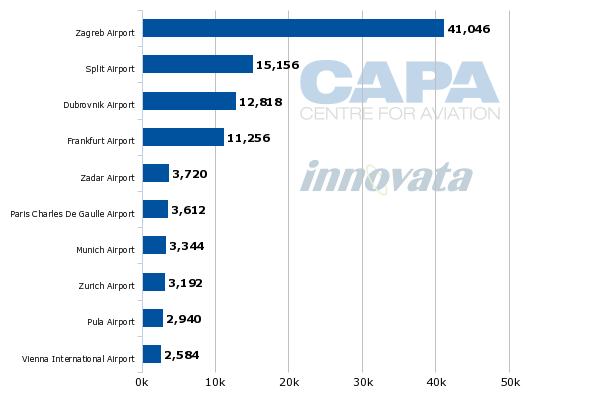 It is possible that the smaller five or 10 European airports served by Croatia Airlines would represent new destinations for a bidder, but they may not be sufficient to generate significant interest. Nevertheless, a potential bidder seeking a small foothold in Europe may be interested in the opportunity presented by the planned expansion of terminal capacity at Zagreb to add destinations, particularly those with year-round demand, and to increase frequencies. Any new owner would also need to be satisfied that Croatia Airlines can develop an efficient cost base in order to price its product attractively against growing LCC competition and become sustainably profitable. In the second part of our report on the carrier, we will examine its cost base and financial performance.